How much are your American Express Membership Rewards Points worth? It is important to note that American Express Membership "Rewards" and "Points" are the same and will be used interchangeably. The dollar value of an American Express Membership Reward Point remains constant at $0.01 no matter what it is used for. Here at Ratehub.ca we have determined that the rate of redemption is 1,000 points for a $10 credit with a minimum redemption of 1,000 points. Yes, you can pay for taxes, fees, and surcharges using points Yes, points are worth $0.01 each within the American Express TripFlex program. Yes, you can transfer your Membership Rewards points to a wide range of participating loyalty programs. Programs include Aeroplan, Delta Skymiles, Starwood Preferred Guest, and many more. Yes, TripFlex allows you to book travel using any provider and on any airline. Yes, you have up to 12 months (via phone) and 3 months (via web) from the date of travel purchase to redeem points (minimum redemption is 1000 points). No, there is no expiration date while you are an active member. American Express Membership Rewards points can be redeemed using their TripFlex program, or they can be converted to frequent flyer miles and frequent guest points. The TripFlex feature allows you to book any travel expense wherever you want and then redeem Membership Points against the charge on your credit card statement. You have 3 months from the date your travel transaction is posted to your account to redeem your points online, or 12 months from the transaction posting date if you redeem by phone. There is a minimum redemption requirement of 1000 points ($10). American express has introduced Plenti, a new U.S. based loyalty coalition program. This program allows you to earn redeemable points at certain retailers, very similar to the Air Miles program, with the added flexibilty of using any form of payment that the retailer accepts and still earning points (i.e. cash, credit, debit, prepaid, etc.). There are already thousands of participating retail locations headlined by: AT&T, Exxon, Macy’s, Mobil, Nationwide, Rite Aid, Direct Energy, Enterprise Rent-A-Car and Hulu. Another great feature of the American Express Membership Reward Program is the ability to convert your points to other popular frequent flyer/frequent guest programs. There are no transfer fees when exchanging for hotel frequent stay programs or a non-U.S. airline's frequent flyer programs. U.S. airlines are subject to an excise tax fee of $0.0006 per point exchanged up to a maximum of $99. Below is a list of popular eligible programs and their exchange ratios. American Express Membership Rewards points can be used to cover taxes and fees. The American Express Membership Rewards program offers some exeptional point tranfer options with other popular rewards programs. The two programs which we have found to actually provide a "bonus value" for your points are Aeroplan and the Starwood Preferrred Guest Rewards Program. You are able to transfer points between these programs free of taxes or fees, allowing you to take advantage of the higher dollar values per point these programs provide. Ratehub.ca has calculated the dollar value of an Aeroplan Point to be $0.0120, and the dollar value of a SPG Starpoint to be $0.0223. It is worth noting that Aeroplan and Starwood have variable values and the figures used in the calculation below are based on an average dollar value per point. Visit the Aeroplan and SPG Starpoint redemption guides to become familiar with the in's and out's of the respective programs and how to receive the highest possible value for your reward points. By transferring your American Express Membership Rewards points to Aeroplan, you receive a 20% increase in the value of your points (on average). By transferring your American Express Membership Reward points to SPG Starpoints you receive a 11.5% increase in the value of your points (on average). If you are interested in accumulating the greatest number of points in order to redeem in the future, we recommend booking travel using the American Express travel website. When you book using the American Express website, you earn 1 extra reward point for every dollar spent, on top of the points your credit card already provides, allowing you to accumulate points for future travel. For most American Express cards this results in 2 points per dollar of travel (1 point per dollar of travel + 1 bonus point). However if you own the American Express Gold Rewards credit card you receive 3 points per dollar spent (2 points per dollar of travel + 1 bonus point), which is an exceptional deal. If you are interested in cheap travel, it is recommended that you use the TripFlex option. This allows you to book the cheapest flights, hotels, etc. and redeem your points against the charges on your credit card bill. Although there is no reward point return on your travel expenses (beyond what your card typically offers), you can save money by booking discount travel unavailable through the American Express Website. The best way to maximize how many American Express Membership Reward points you can earn is by using a credit card that rewards you more points for various purchase categories. For example, when using the American Express Gold Rewards credit card, you receive 2 points for every dollar spent on gas, groceries, travel, and at the pharmacy, along with 1 point per dollar on all other purchases. Lets take a look at an example below, to calculate the overall points earned per dollar spent, when using the American Express Gold Rewards card. In the above example, for every dollar spent, $0.015 were earned (1.5 points * $0.01) that can be used towards travel. A 1.5% return on a card is good value. 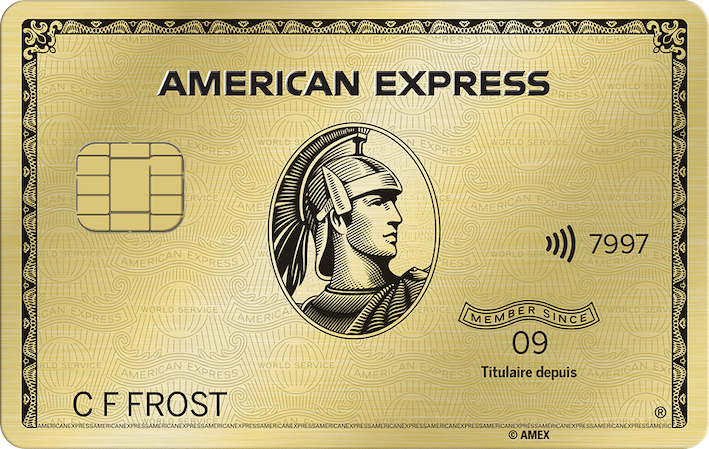 However, the problem with this card is that it is an American Express card and many vendors will not accept it. If you are considering this card make sure the grocery stores and gas stations you go to accept American Express (for example Loblaws and Costco do not).